12239 N. Community House Road. 704-544-0074. 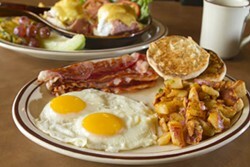 Hours: Sunday and Monday 7 a.m. to 3 p.m.; Tuesday to Saturday 7 a.m. to 8:30 p.m. www.brigs.com. You know," the server at the neighboring table stated confidentially, "we serve our menu all day. So you could have a burger at 7 a.m. if you want to." "Like a diner," the customer replied. Well, maybe not exactly. Brigs Restaurant does not have the diner look — the expansive windows, the neon of northeastern diners, the roadside exposure. The interior is modern fast casual with dark ceilings, and walls painted in muted earthy tones of reds, yellows and browns. Roosters show up in 3-D along booth dividers and in frames. The kitchen is circa 1980s and hidden, while the music is distinctively older. But like a diner, Brigs' menu is served all day and modestly priced. The 138-seat Brigs, which opened in July, is the first outcropping of this franchise in the Charlotte region. The Brigs concept began life in 1988 with restaurants in Cary and Raleigh. Johnny Creech, the owner of the Charlotte franchise, also owns the Durham/RTP store, which he bought six years ago. The Charlotte location marks the sixth Brigs in the state. The service on my visits was generally good, with the wait for breakfast dishes less than five minutes. Dinner takes longer. But it's that quick timing during the weekday rush that is critical and makes Brigs a safe bet in the morning. 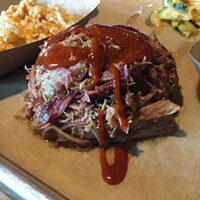 Creech notes that the Charlotte menu is identical to Brigs across the state and that he has line cooks in the kitchen, not chefs, since the recipes are the same and have been perfected throughout the years. The kitchen specializes in traditional breakfast and lunch dishes and has one section devoted to lighter appetites. Kids' meals are under five bucks. To be clear, Brigs does not break new culinary ground. Eggs dominate the morning menu, which includes the nine regular Benedicts with a rotating "Benedict of the Month." 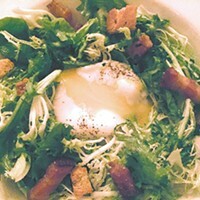 Last month's Rockefeller Benedict was not a memorable dish. A copious amount of creamed spinach, studded with a few small sautéed oysters, sealed a duo of poached eggs huddled within a small skillet. Better were the eggs cooked to order. All of the 20 omelets contain cheese; one, in fact, is a triple cheese omelet. 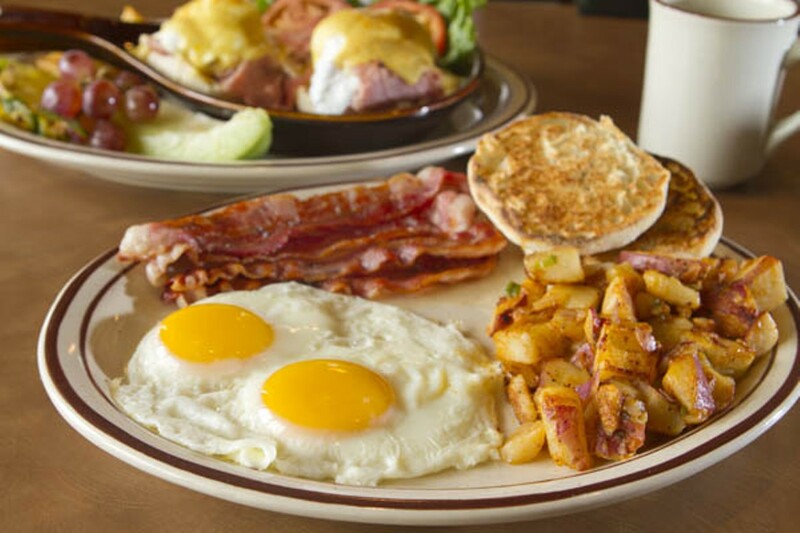 All six dishes in the Royal Skillet family — eggs over home fries — have cheese, too. Cheese is a major player in most dishes, and not melting dollops of cheese, but pervasive cheese. The lure of a stack of cakes seems to instigate swoons and clamor throughout the dining room. Pumpkin pancakes, the special through November, are piped with whipped cream. The sandwich board offers croissant sandwiches, chicken breasts, a Reuben, tuna melt and nine flame-broiled burgers. The latter arrives on a soft Kaiser roll. Some of the sides are better than others. I liked the home fries, while the macaroni and cheese had little to note. What I missed seeing on the menu, besides biscuits, was freshly squeezed orange juice or a signature jam or salad. The dishes are predictable, which may be comforting to some, but where is the "it" factor? The signature item? The salad roster has the usual suspects: Cobb, spinach, chef, Greek. The Waldorf-Chicken Salad, a cupful of diced chicken with apples, raisins, celery and pecans, lacks a vivid fresh texture. But one of the strong points at Brigs is fruit. This salad is sided with an abundance of grapes, honey dew and orange slices, and even some fresh pineapple.